Maruti Suzuki 800 is India's iconic car that had actually put India on wheels. It was first launched in 1983 to bring the joy of motoring to millions of people across the country. Today the car is known as a status symbol for brand Maruti because it holds the complete credit for the recognition and value the car manufacturer holds today. The launch of Maruti Suzuki 800 was the mark of a new era in the Indian automotive industry. 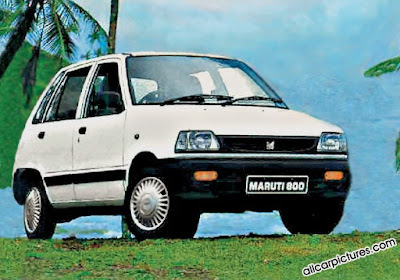 The first Maruti 800 was the outcome of the alliance between Government of India and Suzuki Motors, Japan and was assembled using imported car components. Gradually, as the car climbed up the value chain speeding across economic and social barriers, the production became localized. Over the years the M800 has received numerous upgrades and modification to speed up with the changing needs of the changing generation. The present day M800 has received major upgrades on the exterior as well as the interior. It has also received technical modifications to meet advanced emission norms. The Maruti Suzuki 800 is available in four variants powered by 796 cc Inline 3 engine that generates 37 bhp. The M800 duo runs on petrol and LPG offering 37 bhp and 35 bhp of power output respectively. It is available as petrol variant and duo variant in both standard and air-conditioned versions. The Duo variant runs on both LPG and petrol with a convenient petrol/LPG switching option that ensures zero power drop while changing fuel modes. It beholds a company fitted 20-litre LPG cylinder that is absolutely safe and occupies minimal boot space. The easy-to-fit LPG inlet value makes refilling convenient. The Duo variant works on a Gas Mixer System based on Integrated Gas Technology that offers optimized performance and fuel efficiency. With the LPG, the car emits 10% lower carbon dioxide emission than the petrol variant. All the four variants are mated to a 4-speed, all synchromesh manual transmission, MacPherson Strut front suspension, and coil spring rear suspension with gas filled shock absorbers. Moreover, with a small turning radius of 4.4 m along with sleek and slim dimension, the M800 is a delight to maneuver anywhere and everywhere. When the first M800 was launched 25 years ago, the industry was taking a revolutionary turn. Creative designing and intelligent engineering was not a part of the industry during the bygone era but now the industry has become much advanced with host of innovations entering the market. One of the oldest Indian passenger cars that were earlier designed with the only aim of providing a means of mobility to millions of people is now fully loaded with a range of exciting features. The New Maruti Suzuki 800 is adorned with a completely new grille accentuated by the Suzuki trademark. Moreover, the clear lens headlamps, rear combination lamps, and sleek dimension of the car add a touch of excitement to this otherwise sober car. In the interior dual tone upholstery exude warmth along with a host of functional amenities available. The reclining and sliding front seats, glove compartment, sun visors, front door pocket, floor and luggage room carpets, and cabin light add comfort to every journey. Though the tiny little car is not equipped with host of innovative technologies it is definitely one of the best city commuters with the just more than enough features for ensuring a refined and pleasurable ride. The New Maruti Suzuki 800 also ensures new age security and superb safety to drive away the car with total peace of mind. The specifically placed crumple zone absorbs the impact energy in case of an accident. Furthermore, the high mount stop lamp, collapsible steering column, rear seat belts, and side impact beams improves safety of the car as well as the passengers. It is also equipped with an option of headlamp leveling that allows the driver to adjust the beam angle to provide optimum visibility. To ensure security of the car the new 800 also comes equipped with an ICATS (Intelligent Computerized Anti-Theft System) technology. ICATS is an electronic system that works on digitally encrypted codes to ensure that the car starts with an original key only. This ensures car security and delivers a stress free drive. It's great information is sharing with us about Maruti Alto. I wants to Buy Maruti Alto 800 Tyres Online set of 4 tyres. hello friends,recently i visit your blog.Its awesome,thanks for sharing this.If anyone wants to Buy Maruti Alto Tyres Online in lowest price in delhi.